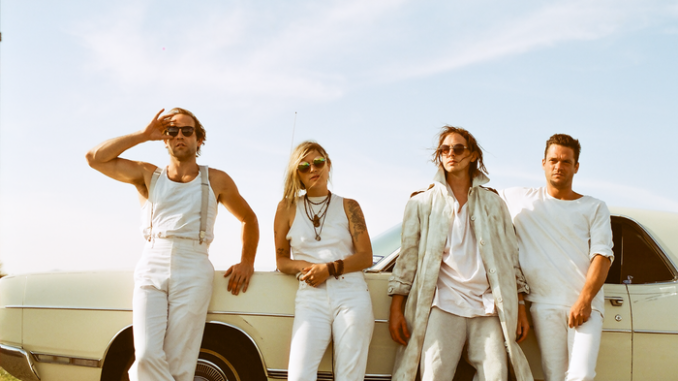 Oklahoma band BRONCHO will be heading out on a UK headline tour in Feb/March, stopping off in Glasgow, Manchester, London and Brighton – they’ll also be doing a one-day session at the legendary Abbey Road Studios and playing the Apple Store in London on 25 February. The band, consisting of Ryan Lindsey (vocals/guitar), Nathan Price (drums), Ben King (guitar), and Penny Pitchlynn (bass), share their new video for “Keep It In Line”, directed by Miles Rogoish, via XS Noize. The track comes from their recent album Bad Behavior, released via Park The Van. Having toured with Queens Of The Stoneage in the UK and Europe in 2017, Tulsa, Oklahoma’s BRONCHO return with an album of thoughtful, nuanced rock and roll with an art school spirit and a punk rock heart. The band’s fourth album, Bad Behavior, reveals their fly-on-the-crumbling-wall vision of our moral climate, complete with a reenergized, accessible sound and the charmingly sardonic, smiling-while-sneering delivery of singer and bandleader Ryan Lindsey. The album has to date racked up over 3.5 million plays on Spotify. 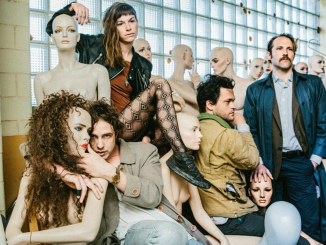 BRONCHO are a tight unit who have seen their songs featured at influential TV and radio and have toured the U.S. and Europe, including arenas with the likes of Queens of the Stone Age, The Growlers, Portugal The Man, and Cage The Elephant. In the gritty warehouse district of Downtown Tulsa they have carved out a physical place for themselves, an industrial blank space where BRONCHO can experiment with sounds, performance, visuals, and more. It’s where they recorded Bad Behavior with producer Chad Copelin in the first half of 2018, a controlled process that allowed them to work at their own pace and by their own standards, almost like a secret club. Bad Behavior slinks and purrs with a sense of lascivious flirtation. Lindsey sings with a mischievous twinkle in his voice, peppering his verses with suggestive uh-ohs and ahhs and at times barely pushing out his words to the point of whispering. The lyrics match the primal pulse of the songs’ moods and vibes, and their pop sensibilities create a world where T. Rex,Tom Petty, The Cars, and The Strokes collide. The record is filled with references to religion, sin, drugs, vice, and scandal bubbling just under the surface. It’s a palette familiar to anyone who has ever turned on the evening news.